A long smoke, with a nearly perfect draw and a nice even burn, the No. 1 can be enjoyed for hours. It is rolled by expert hands in one of the premier factories in Honduras. It uses vintage Honduran long filler tobaccos, which offers a smooth burn and hints of cocoa and nutmeg. It is wrapped with an exquisite light Honduran Connecticut. The sweet gum cap provides the perfect finish. Packaged in a Cedar Chest of 25. 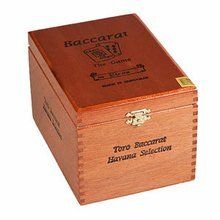 Buy a box, get 6 Baccarat Rothschild cigars, valued at $31.80, absolutely FREE! Always been a big Baccarat fan. Very flavourful 25-35 min smoke. Pair with strong cup of coffee. 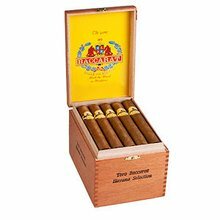 My favorite cigar at a reasonable price. The cigars are great, I have been smoking them for years. From time to time one will not draw well. I am sorry I can't say the same for the shipping. I paid for two day air and it took three days.... rip off.Don't fall for it, it is not worth the extra money. Just me and my dog! 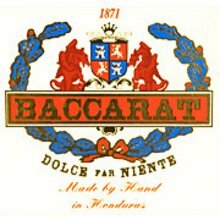 I smoking baccarat for more than three years. A sub of Davidoff this stick provides that,after a long day,help to provide that move toward great relaxation by the pool or on the deck. Don't forget Irish neat. Never had even one problem. Smoked them for years. Mild, smooth and good price. JR Cigars is my go to store for cigars. A delicious treet to enjoy while tending the barbeque on a Sunday. A mellow stick to relax with in the great outdoors. Good, flavorful, mild smoke. Had good construction, nice draw and burnt very evenly. Good smoke...very smooth. These are my very favorite cigars. They are mild, consistently good, and reasonably priced. I highly recommend them. Spicy and nutty with a smooth smoke and vanilla flavor come out of this very nice and even cigar.